Normally I'd expect to see Puntarelle on sale between November and February. This member of the Chicory family (Chicoria Catalogna) being a cool weather crop, I can only assume the weather in Italy is mirroring our own this winter as there seems to be lots of it around. I don't know about you but I'm getting pretty jaded with cabbage, celeriac, parsnips and leeks, which are our seasonal veg in the UK at this time of year. It's been so cold my "early" purple sprouting brocolli is reluctant to sprout this year, which means my "late" brocolli will probably emerge at the same time and I'll be inundated with it in April. In the meantime I picked up a head of Puntarelle for a change. Italians generally use the whole of the Puntarelle in a salad, patiently slicing the heart thinly lengthwise and soaking it in cold water until the leaves curl up. But this is a cold winter's day in London, time is short, so this is my way with Puntarelle. I use the outer leaves as a vegetable accompaniment to meat - the bitter quality is, I think, particularly good with a beef casserole and mashed potatoes, which I have planned for tomorrow (Cut the stems into manageable 10cm lengths, place in a pan with a knob of butter, a couple of tablespoons of water and a pinch of salt, and cook for 3-4 minutes until they are softened and the water has disappeared). The knobbly, juicy heart and the inner leaves make a refreshing salad lunch. Anchovies pair well but this time I've used bacon for that salty hit and the tiniest capers for piquancy. Crisp bread croutons add a satisfying crunch to the juicy, slightly bitter chicory heart. Strip away the outer leaves of the Puntarelle and save for later use. Pull away the juicy little nodules from the heart, slice each of them lengthwise into 3-4 pieces and place in a bowl of cold water. Mix the last four ingredients to make the dressing in a lage salad bowl. Fry the bacon until crisp then remove and add the bread croutons to the same pan (add a little olive oil if necessary), cooking until lightly browned. 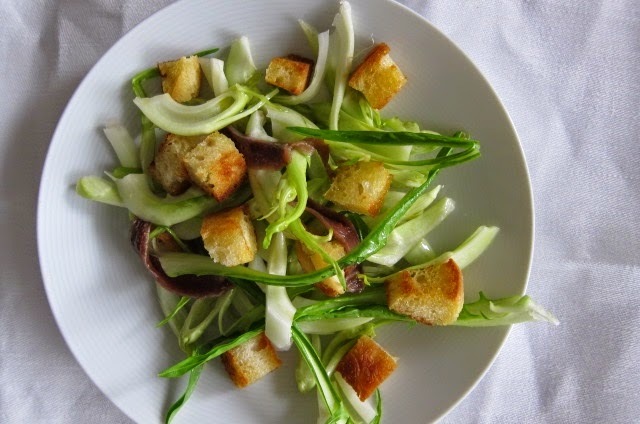 Drain and dry the Puntarelle well and add to the salad bowl, mixing well with the dressing. Add the cooked bacon and croutons and serve.